Organized at Cincinnati, Ohio, July, 1886. "to provide a uniform system for all Hebrew Sabbath-schools in the United States by promul-gating a uniform course of instruction and by training competent teachers." It was the first attempt to secure united effort in the cause of Jewish religious education in the United States. 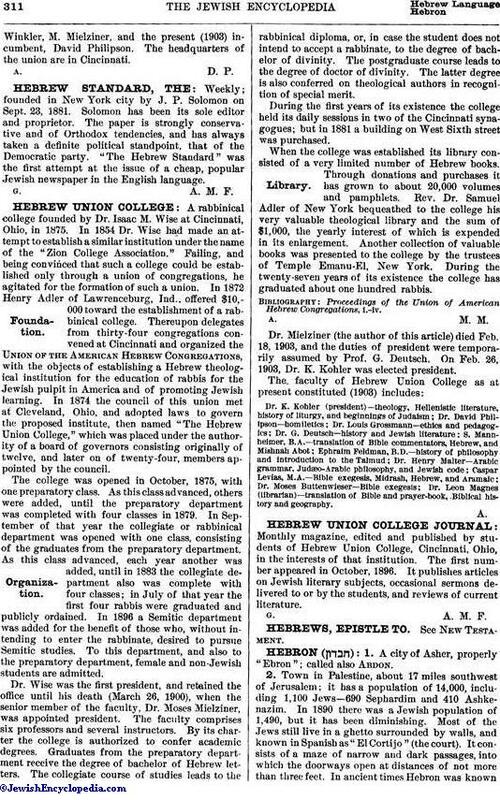 The union has paid special attention to publishing text-books for religious schools; among its publications may be mentioned: "School Edition of the Book of Proverbs," by Adolph and Isaac S. Moses; "The Ethics of the Hebrew Scriptures," by the same authors; "Selections from the Psalms," by M. Mielziner; "How to Organize a Sabbath-School," by Henry Berkowitz; "Guide for Jewish Sabbath-School Teachers," containing papers on instruction in Biblical history by K. Kohler, in post-Biblical history by B. Felsenthal, on religio-moral instruction by David Philipson, and on the teaching of Biblical history in primary classes by Edward N. Calisch. The union has introduced the leaflet system, and has published three series of leaflets on Biblical history, and one series on religious themes, such as "The Love of God," "Our Love for God," "Love and Respect for Parents," "Truth-Speaking," etc. These leaflets are used in over one hundred schools throughout the country. 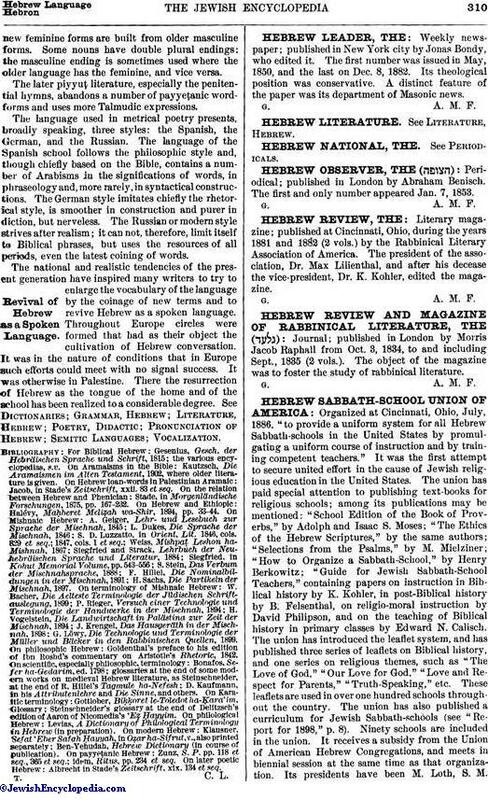 The union has also published a curriculum for Jewish Sabbath-schools (see "Report for 1898," p. 8). Ninety schools are included in the union. It receives a subsidy from the Union of American Hebrew Congregations, and meets in biennial session at the same time as that organization. Its presidents have been M. Loth, S. M.Winkler, M. Mielziner, and the present (1903) incumbent, David Philipson. The headquarters of the union are in Cincinnati.